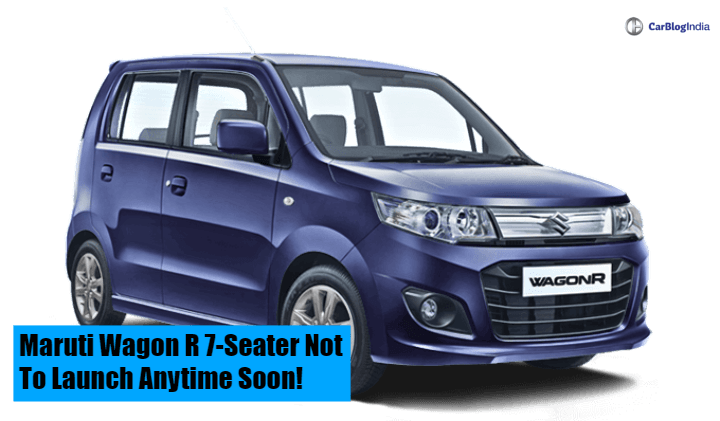 Maruti Wagon R 7-seater was earlier reported to go in production in September 2018. However, it is confirmed that it won’t come to India anytime soon. Check out the details and know the reason for this. Earlier, we had reported that Maruti Wagon R 7-Seater might launch in India. With several sightings of the Suzuki Solio in India, there were speculations about the budget MPV making its way to India soon. However, recent reports suggest that the Wagon R 7-Seater would not launch in India anytime soon, because it is not feasible here. The officials have stated that it is not feasible due to low demand for MPVs in India. Currently, Maruti Suzuki has 3 MVPs in its lineup. While Eeco and Omni are affordable and mostly commercial ones, Ertiga is comparatively a premium offering. The Wagon R 7-seater was expected to launch in India at a price of around Rs 4-6 Lakhs, making it compete with Datsun GO Plus and upcoming Renault RBC. The 7-seater version was expected to be a bit more pricey than the normal 5-seater version. However, the rest of the engine specifications and features will be the same for both the cars. Currently, Maruti Wagon R next-generation is expected to launch by end of this year. It is already under development and we expect it to be priced starting from Rs 4.5 Lakhs up to Rs 6 Lakhs. There would be a minor difference between the prices of the current version and the upcoming version. Currently, MPVs as such are not in great numbers in the market. There is the Datsun GO Plus, Maruti Ertiga, Toyota Innova Crysta, Renault Lodgy and Tata Hexa. Amongst these, Ertiga and Innova are the most successful ones in their respective price segments. However, still, the demand for an MPV in very low in the market. Most of the families, if you see, are nuclear. So they are happy with a hatchback or a sedan or even a compact 5-seater SUV. MPVs are bigger, tough to handle and a problem to park. A lot of Indian families prefer to have 2 cars at home instead of a single bigger one. So for a bigger family, the number of cars are usually seen increasing. As we said earlier, the Wagon R 7-seater is not coming anytime soon, but the 5-seater Wagon R is mostly come by the end of this year. The Maruti Suzuki officials said that the hatchback is under development. It will continue with the 1.0 Litre K-Series engine that produces 65 BHP of power and 91 Nm of torque. It will come with features such as Projector Headlamps, Alloy Wheels, Keyless Entry, Tilt-Telescopic Adjustable Steering Wheel, Multi-Functional Steering Wheel, Touchscreen Infotainment System, Automatic Climate Control and Parking Sensors With Camera. For safety, it will get Dual Airbags, ABS with EBD, ISOFIX Child Seat Mounts, and Reverse Parking Sensors. The expected price range is starting from Rs 4.5 Lakhs up to Rs 6 Lakhs, easily.